Bob Weinroth, Boca Raton City Council Member for the last four years, is speaking to the Gold Coast Tiger Bay Club on April 11th, at City Fish Market. Join members and guests for this luncheon and networking event. Tickets can be purchased here, on this web page. 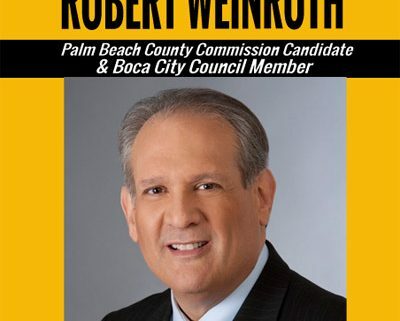 Robert S Weinroth was first elected to the Boca Raton City Council in a special election in March 2014 and was re-elected to a full three-year term, without opposition, in March 2015. In his first term on the City Council he served as Vice-Chair of the Community Redevelopment Agency. In March 2015 he was elected to serve as Deputy Mayor. Weinroth represents the city on the Palm Beach Metropolitan Planning Organization, recently renamed, TPA, Transportation Planning Agency, where long-range and short-term transportation planning for Palm Beach County is addressed. He was appointed by the PBC Board of Commissioners to serve on the Palm Tran Service Board where he’s been elected chair. The County Commission has delegated it’s responsibilities to the PTSB which helps to shape policies aimed at providing reliable public transportation in our county. In addition, he chairs the PBC Transportation Disadvantaged Local Coordinating Board. Recently Robert was appointed to serve on the Legislative Policy Committee of the Florida League of Cities and he is the Alternate Council Member at Treasure Coast Regional Planning Council. Weinroth is an attorney and small businessman. He is married to Pamela with four boys and two dogs in their blended family.